We love the summertime because it feels like everyone just gets together more. Whether it’s for cookouts or baby showers, there seems to be more gatherings between family and friends. As someone who loves to host, I just love it! But I also know the stress that can come along with hosting. Who to invite? What to serve? We can’t help you with the guest list, but we can help with the menu (and we’ll help you stay out of the hot kitchen during these long, hot days). How about a deliciously light and refreshing plate of meats, cheeses, fruits and nuts that’s not difficult to make and can be set out for everyone to pick at? Sound good? We thought so! Here’s how to make the perfect Summer cheese board. 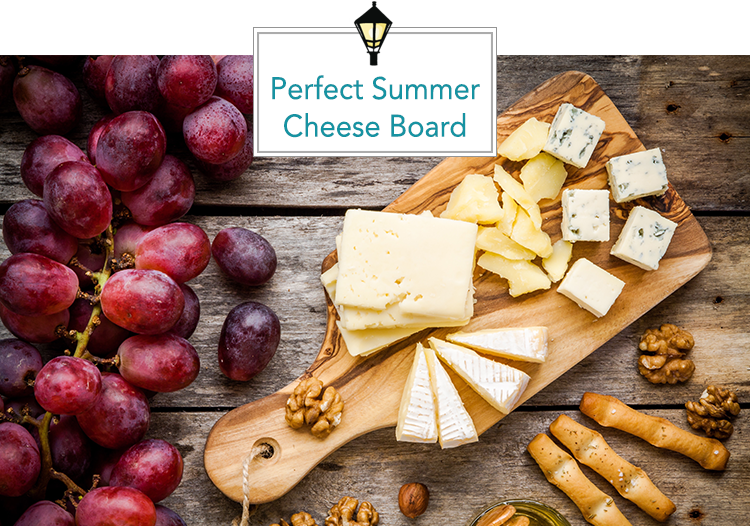 The best part about a summer cheese board is that you can pre-make it and actually enjoy your party. No slaving over the oven or timing up different dishes; just put the pieces together, set it in a gathering area, and watch your guests do the rest! Remember, this can be as complicated or as simple as you like. And that goes for what you’re serving it on as well. While an Instagram photo is great and all, you don’t have to make a masterpiece. A simple cutting board is completely fine AND looks great. Ok, let’s get started! Like the friends who we’ll share it with, a cheeseboard is built from the inside out. But what do we want as our centerpiece? We like to feature our fruit here because it makes for a colorful center that we can spiral out from. Plus, any excuse is a good excuse to hit the Farmer’s Market, and making a cheese board is as good as any! You really can’t go wrong with your choices here, but we always enjoy strawberries, grapes, blackberries and figs. You can also spread them around the board later once everything is assembled. Now it’s getting fun! Let’s pick out three to four different styles of cheeses that you think will appease everyone’s palates. Our choices boil down to 3 things: firmness (soft or hard), type (from what animal) and taste (sharp or mild). Ricotta, chevre, and feta are some really nice choices during the summer months. Other classic options include mozzarella, swiss, cheddar, Parmigiano Reggiano, gorgonzola and brie. Whatever you choose, just make sure you have a variety of flavors and firmness, that way you don’t leave anyone’s tastes out! While you don’t have to twist many arms to get people to love a cheese plate, you can always kick it up a notch (channeling our inner Emeril). An easy way to do that is make this a cheese AND charcuterie board. This also makes the board much more filling so your guests won’t be terribly hungry after. Mix in some prosciutto, a variety of salamis or even some smoked sausage (pro-tip: sprinkle on some Rendevous seasoning). Don’t be afraid to fill up your board to the point of overflowing. We promise your guests will take care of it! Now for the vessel on which to transport these delectable cheese and meat slices. This is another choice where you simply can’t go wrong, but you probably do want to include both bread and crackers. Crackers work well for the harder cheeses, while the bread is lovely for the softer, more spreadable varieties. Check out this amazing recipe for flaxseed, fig and walnut crackers. For an even extra special board, we like to add some spiced nuts and some sweet jam. Sweet, salty and spicy never hurt a plate, so throw in some Spanish Marcona almonds or pistachios and add a bowl of apricot spread or a fig or spicy chili jam, and you have taken it to the next level. Make sure you have the appropriate knives to cut each type of cheese and spread your delicious jams. Also, don’t forget some toothpicks to help make the picking process easy and neat. Finally, add a light summery drink with it like a sangria, a sweet white wine or even a hoppy lager will be delicious and bring out different tastes of the cheeses. *Take a trip to one of our favorites, St. James Cheese Company for some tasty options.